Here’s another trip report from last spring, Enjoy! Sinus issues have been slowing the Miss down the past few days, so she decided to stay back and rest while my roommate Kyle and I went up to RMNP to bag another line. Winds were much higher than forecasted and our original goal of the Notch Couloir didn’t look like too much fun since we would be at the mercy of the winds for a long time. We decided to go for option #2 and drop into Dead Elk Couloir, another line on my to-do list that I had been scoping for a while. We chose this because we would avoid the hike all the way around divide and I thought it would be a little more protected from winds, allowing the snow to soften up. We droppen in and rode to the downclimb, and found icy conditions as well as the winds ripping thru the choke. Not exactly what I was expecting. We slowly worked our way thru, being cautious of the ice and loose rock, and worked together to get our gear down each section. knew well before dropping in that there was going to be a possible jump at the end of the downclimb. This aspect of the line was not a surprise. After scoping it out, I decided the left side of the boulder looked better to descend. I judged this by how deep a good-sized rock that I had pushed down had landed in the snow. It appeared to be soft on top and I assumed that winds coming thru the choke would transport snow below this boulder. It was only a 2’ drop for me, so I lowered myself till the last possible moment and then let go. This is when things went bad. Before I continue, here’s some POV what happened in Dead Elk. I slid. I kept sliding. I went over a boulder and slid even more. Kyle watched in horror as I came to a stop 25’-30’ below the downclimb. Somehow, I had managed to immediately get into a self-arrest position upon hitting the snow. It all happened in slow-motion as I dug my axe into the snow and held on for dear life, coming to a stop below the giant boulder I had just ridden over. I was extremely shaken up by what just happened and pretty freaked out to be 100% honest. I collected myself and I hiked back up as far as I could, only to find a section of bulletproof snow between Kyle and I. With no crampons, there was no way to get back to Kyle. Originally, we planned to hand gear down after each section to allow us to be more maneuverable. Now Kyle had two boards and the daunting task of getting down with both of them. At this point, all I could do was watch and be Kyle’s eyes from below. There was no way he was going to descend the same way I did, so he went back to the right side of the boulder. 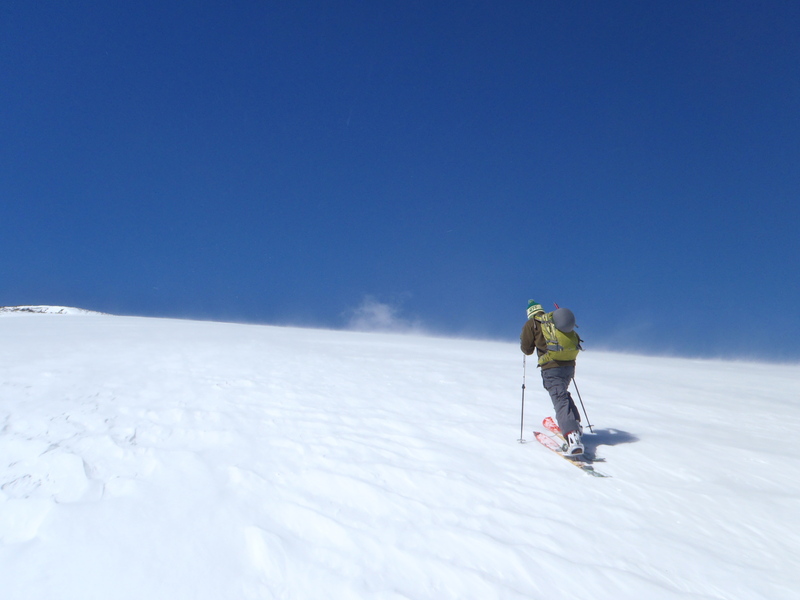 He placed the snowboards vertically in the snow and used the bindings as a step to allow him to step down in control while avoiding a fall into the giant gap between the rock and snow. Carefully, he strapped my board onto his pack and laid it above him. Then, he cut himself out a very small bench to lay his board on. Facing uphill, he strapped in. This was not easy. With a boulder in front of him, ice behind him, and a gaping hole beside him, words cannot describe how difficult this move was. Kyle pulled it off and then threw his pack on with my board attached to it and slideslipped down to me, where I repeated his move. With the ice axe keeping my board from moving, I strapped in facing uphill as this entire section had refrozen and a toeside edge was essential. I sideslipped down, not making a single turn until I had reached daylight and soft snow. Kyle and I stopped, put our axes away and gathered ourselves before making turns in heavy powder down the apron. These were some of the best turns of my life, mainly because I knew that our “ordeal” was over and we were out of there safe. I’ve been replaying these events over and over in my mind, not only extremely thankful to ride away without a scratch, but also with the goal of learning from this. 3) Stayed cool. While both of us were freaking out on the inside, we remained calm visibly. This was key for both of us. It was a reassurance of sorts that we were going to be ok.
1) Body position during self-arresting. I was unable to fully position myself over my axe for two reasons. I wasn’t able to pull myself up on my axe and I became too focused on the boulder, slowing my reaction to properly stop myself. 2) I did not bring crampons. I’m torn if this would have actually helped me. If I had them on, I believe I would have tumbled head over heels. But then again, I would have made it back to Kyle. 3) Misjudged the snow and made assumptions. I consider myself very fortunate. While this may not seem like much, it could have gone very differently in my opinion. I’m very thankful that I had an excellent and competent partner and friend that day. Without him, this would have been a very different experience. I made mistakes this weekend.